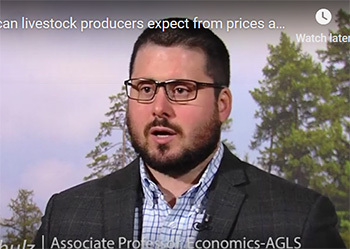 Chad Hart, associate professor, was quoted in a Markets Insider story on Jan. 14, 2019, on the outlook for American soybean farmers. Visit DIA.mil for more information. Lee Schulz, associate professor, expects record U.S. production for beef, pork and poultry in his forecast for 2019. 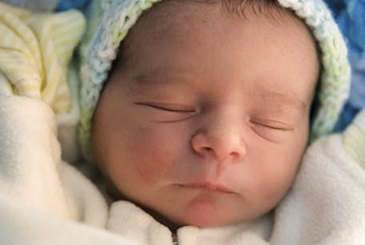 Jeff and Adriana Valcu-Lisman are the parents of son Connor Theodore Lisman, born Jan. 4, 2019, at 12:21 p.m. The newest Lisman weighs 6 lb. 10 oz. and measures 20 in. long. Congratulations to the proud parents! Sandell Grants provide the opportunity for junior scholars or non-tenured scholars to pursue research on retirement or disability policy. The program is open to scholars in all disciplines. Proposal guidelines are available online. 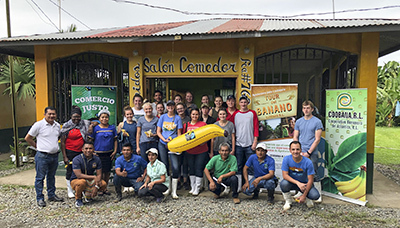 Ebby Luvaga, senior lecturer, left Iowa Dec. 28, 2018 to lead a group of 17 CALS students on a study abroad trip to Panama, a trip she's been conducting since 1999. Ghana Health and Education Initiative (GHEI) is offering an international volunteer opportunity for students next summer in Ghana. Dermot Hayes, professor, was quoted in a story in the Jan. 1, 2019 The Epoch Times titled "Agriculture Remains a Sticking Point to US–EU Trade Deal." John Crespi, professor and interim director of the Center for Rural and Agricultural Development (CARD) was quoted in a Dec. 27th story in the Gazette. 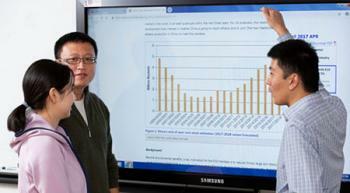 Wendong Zhang, assistant professor, was interviewed for a Dec. 26, 2018 story on Radio Iowa on results from the annual farmland value survey. Riley Arthur is on the run. 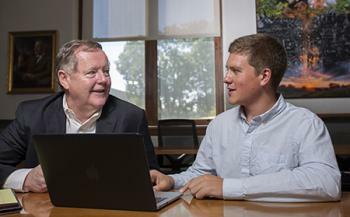 The junior majoring in agricultural business and economics is chasing not just a degree, but the full-blown Iowa State experience. Arthur, an Owatonna, Minnesota, native, worked as an intern this summer with ethanol processor Flint Hills Resources. Members of the Center for Agricultural and Rural Development (CARD) hosted a group of four researchers, led by Dr. Shiping Mao, from the Institute of Agricultural Economics and Development (IAED) of the Chinese Academy of Agricultural Sciences (CAAS) from Dec. 10-15, 2018. 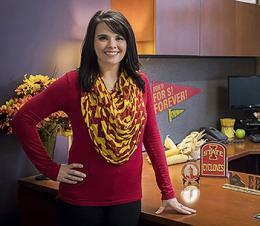 Elizabeth Burns-Thompson ('11 ag business) was the subject of the story by the Iowa State University Alumni Association. Ina De Inza Niemeijer ('16 ag business, econ) has been named the CALS Young Alum of the Month for December, 2018. Ina is currently the Human Resources Coordinator at Renewable Energy Group, Inc. in Amsterdam. Lee Schulz, associate professor, and Alejandro Plastina, assistant professor, were interviewed for an Dec. 14th Pilot-Tribune article on farm markets. 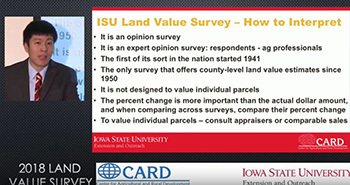 Results of the 2018 Iowa Land Value Survey show that after a reprieve in 2017, commodity prices, interest rates, and trade disruptions drove Iowa farmland values down for the fourth time in five years. The average statewide value of an acre of farmland is now estimated to be $7,264. David Swenson, associate scientist, and Liesl Eathington, assistant scientist, assisted in interpreting new American Communities Survey data on median household income growth by county in Iowa and poverty rate changes for Kevin Hardy, Des Moines Register. Leigh Tesfatsion, emeritus professor, has been elevated to the grade of Senior Member of the Institute of Electrical and Electronics Engineers (IEEE). 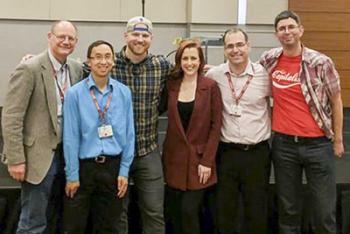 Senior Member is the highest grade of the IEEE for which a member may apply. The CALS Student Council will present the 2018 Senior Outstanding Ambassador of Agriculture Award to Kayleigh Koch, ag bus senior from Hawkeye, Iowa. The graduating senior who served as CALS Ambassador, will be recognized for her efforts in recruitment and other support for the college.